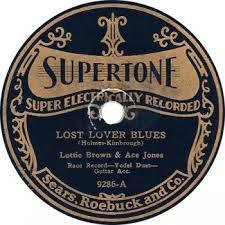 August 21st in Gennett History, 1928: Lottie Kimbrough recorded “Lost Lover Blues” in Richmond. The recording appeared on Gennett 6607, Champion 15591, Superior 2717, and Supertone 9286. In addition to Kimbrough (v), the track features Winston Holmes (v) and Miles Pruitt (g). As an aside, this is one of my favorite Gennett recordings, so much so, that I asked Stacey Earle and Mark Stuart to record a version of it on my Gennett tribute album. Video | This entry was posted in August, Champion, Gennett, Video and tagged August, Champion 15591, Gennett, Gennett 6607, Gennett Discography, Gennett History, Gennett Records, Lost Lover Blues, Lottie Beaman, Lottie Kimbrough, Mark Stuart, Miles Pruitt, Stacey Earle, Superior 2717, Supertone 9286, Winston Holmes. Bookmark the permalink.